Nestlé's bottled water takings, the privatization of water infrastructure and access to clean affordable water impact Great Lakes communities and Indigenous rights. Residents, Indigenous representatives, and water groups came together in Flint, Michigan last September to oppose the commodification and privatization of water and unsettle water sovereignty. The Great Lakes Water is Life Alliance is a coalition of groups and individuals working on water justice issues in Michigan and Ontario. Since Flint, GLC has helped carry this energy forward. On March 14 2018, GLC and partners hosted a online forum to talk about how Great Lakes peoples can take action to shift water ownership into guardianship and uphold the human right to clean water. Themes from the Flint summit were revisited, mainly water privatization and the Detroit water shutoffs. Over 80 people joined online to listen, learn, and post comments and questions. Participants joined from across the Great Lakes. 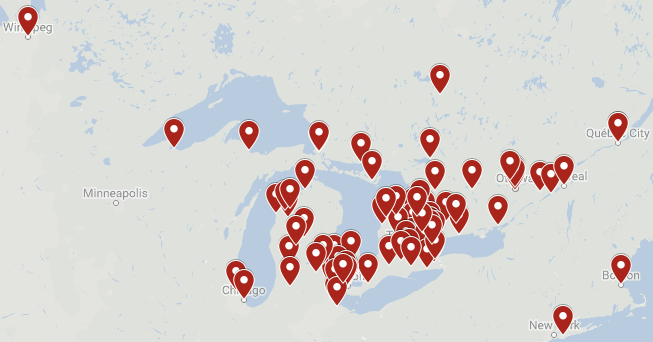 Although this event highlighted specific communities in Ontario and Michigan, GLC recognizes that other water justice issues can be found throughout the Great Lakes and beyond. We are especially cognizant of issues facing First Nations and Tribal communities and have learning about and inviting greater Indigenous perspectives and leadership. We welcome your participation and partnership in any of these efforts to build a water-commons movement.